This is where we started: Festival audio was the first thing that we offered when we first began the company, and in that time it has become somewhat of a specialty of DD Pro Audio: We are proud to have seen our systems and complete audio production at festivals large and small across the whole country. Including pro audio hire systems from RCF line array, Martin Audio, K&F and D&B Audiotechnik + a large range of rider friendly digital mixing consoles and more ready for all of your festival sound hire needs. Will it be loud enough? - How do we get sound over there? - Will they hear it at the back? These are just some of the questions that you don't need to ask when DD Pro Audio does your audio system design. From digital signal distribution across an event site to where the delay towers should be placed: We got it covered! ​ We stock systems for all sizes: from a small beer festival to a 30,000 strong music event, we are passionate about delivering crystal clear, earth shaking audio to every single member of the audience. Our festival systems are weather proof too, so you don't have to worry if the heavens open. ​ We provide the industry with skilled live audio production specialists, Sound Designers, Sound Engineers, System techs and other sound hire and production staff; All ready to lend their unrivalled expertise to your festival. Wireless RF gear can be a complicated beast, but no need to worry: Our Sennheiser certified RF technicians have years of experience to deal with your festivals wireless environment no matter how large or small. Our technicians will look after all of the licensing with Ofcom and we offer a large range of rider friendly wireless systems for hire just let us know what you need! designed staging. 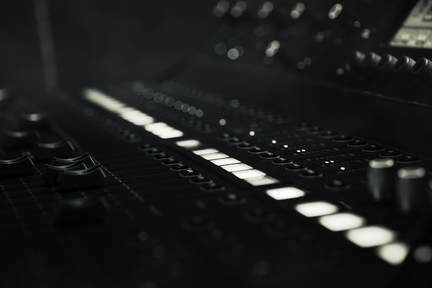 ​ We are an official supplier of Waves Soundgrid and Multirack systems for Festivals: A game changer in the studio now brought into a live environment, Waves legendary DSP and plugins have now been made available to integrate at zero latency with live sound mixing console: However the technology is a big investment and systems are not often found except at the very top level until now!